Browse and share nautical photos. Virtual tours of various vessels. 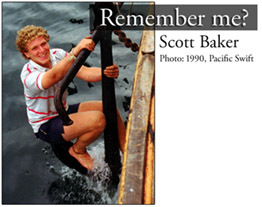 This site was started by Scott Baker in 1992 as a personal exploration of our rich maritime history after being inspired by spending 7 summers crewing on the SALTS tall ships out of Victoria, British Columbia, Canada. Through those voyages, mostly as a Bosun's Mate, on the fore and aft gaff schooner: Robertson II, square topsail schooner Pacific Swift, brigantine: Spirit of Chemainus, and later adding a few splices to the running backstays of the square topsail schooner Pacific Grace a life long passion was fostered - and continues to grow. Since then this site has, and continues to grow through the contributions of others, many past and present shipmates from SALTS. A small crane, usually located astern, used to raise and lower smaller boats from the Deck to the water. To the right is the latest post to our on-line discussion forums. We have provided these forums, not only as a way for everyone to keep in touch, but also to allow those new to SALTS or sailing in general to meet the 'old timers' or merely find out what it is like to sail on tall ships. Meet others with similar interests, and share your stories and experiences in our friendly on-line forum. The image on the left was selected at random from our on-line gallery of sailing photos. Help us build a library of photos from SALTS, other tall ships, and sailing from around the world. Join us, submit your photos and help our gallery grow! I am trying to re-establish contact with as many people as possible that I sailed with in the past. If you sailed on one of the SALTS trips with me, or know someone that did, please drop me a line! Join bosunsmate.org founder Scott Baker as he clearly shows you how to tie knots - learn a wide variety of knots, great to know and use. 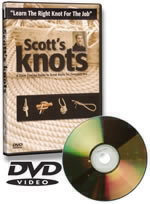 "anyone looking to learn a new knot for the upcoming boating season or perfect an existing knot-tying technique will dig this DVD"
-- Power & Motoryacht magazine. This web site, while not directly affiliated with The Sail and Life Training Society (SALTS), finds it roots closely linked to that society. Many of our site members have sailed with SALTS at some point, or are planning to in the future. 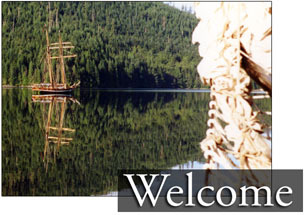 We encourage you to visit the SALTS web site to find out more about their Sail Training and Offshore programs. Bosunsmate.org has created software that allows location positions reported via satellite/email to be plotted on a map. Follow along as daily reports come in from vessels voluntarily reporting to our tracking system. A Thumbnail view of the track with the most recent reported position is shown.